In the animal kingdom, the fight for life isn't always pretty -- in fact, that fight can turn downright ugly, as evidenced by shocking video from the MalaMala Game Reserve in South Africa. 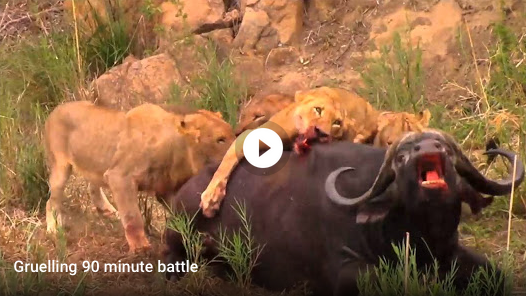 Footage posted to the facility's blog depicts a battle for the ages, as a group of five lions sets its sights on an adult buffalo. For more than an hour, the massive bovine stands its ground, trying to make a getaway before the hungry lions can completely overpower him.